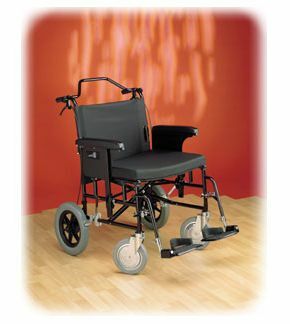 Maxi Meteor Heavy Duty Transit Wheelchair. The Maxi Meteor is a heavy duty transit wheelchair, intended for users up 392lb or 28 stone in weight. However, the manufacturers have also taken care to make it as discreet and easy to handle as possible. When ready for use it weighs in around 54lb, which is quite light for a heavy duty wheelchair of this kind. The frame is strong but compact, and there are a huge range of options available, so you can get the perfect wheelchair with everything you need and nothing you don't- attendant brakes, elevating leg rests, a tray or waist belt. There are a range of seat sizes available for the Maxi Meteor wheelchair, from 16" x16" to a very generous 24" x 20". See below for a list. 12 1/2" puncture proof rear wheels.